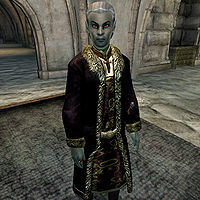 Drels Theran is a Dunmer noble who resides at Castle Bravil. He is Count Regulus Terentius’ "Special Inquisitor in charge of suppressing the Renrijra Krin insurgents", by his own words. Apparently, the Renrijra Krin does not pose a major threat in the Bravil county, as Drels lives a relatively relaxed life and never even leaves the castle. He sleeps in the eastern room of the private quarters every night between midnight and 6am. After waking up, he wanders around the quarters all morning and afternoon, doing absolutely nothing but chat with the other residents. He finally leaves his quarters at 8pm and enters the lord's manor where he eats his dinner with count Regulus and castle steward Dro'Nahrahe. At midnight, he heads back to his quarters and goes to bed. He wears a set of upper-class attire and some jewelry to fit his status: a black & burgundy outfit with gold trimmed shoes and a leveled, un-enchanted ring or amulet. He wields a steel shortsword and carries the key to the Castle as well as the key to the interior. He also carries a large sum of gold. His room contains several sacks, barrels and chests with clutter and clothing, but on some shelves sits a locked jewelry box and the Blade skill book Song of Hrormir. Since he always moves around in the restricted areas of the castle, he can be pretty tricky to meet. If you succeed, he will greet you like this: "Drels Theran. I'm the count's Special Inquisitor in charge of suppressing the Renrijra Krin insurgents." And when asked about the city, he will elaborate: "The Renrijra Krin are Khajiit bandits and smugglers posing as guerillas and freedom fighters."